We have just come back from 3 days away with the extended family. We had decided to explore a little more of the Germany we do not know. We spent the 3 days in and around Nuremberg with 3 children aged between 1 and 7. There were so many things to do, we ran out of time. It is definitely a great family destination. Here is a little bit more about our itinerary and some of our recommendations. We spent a whole day there (and the kids could have stayed longer). The park closes relatively early (18:00), so make sure you don't arrive too late. The price is really reasonable for a park of this type. There are no real rides. It is a play park. The emphasis is on playing, which we loved. Kids of all ages can play in different settings. We loved the gold digging area: three kids (1, 5 and 7) spent ages there trying to find little gold-like stones to fill their treasure chests. We also loved the water play areas (bring a swim suit or clothes to change into) as the weather was very hot on that day. There are also of course plenty of Playmobil toys to play with but this is not over the top. There is a hotel on-site too. A really fun and great day out for the whole family. This is a small section within the large Wöhrder Wiese park. The entrance fee is a little steep in my opinion but we spent over 2 hours there and could have easily stayed longer. The park is opened from May until September. The premise of the park is that little ones from 3 years old can discover, experiment, touch, smell, taste in the middle of nature. 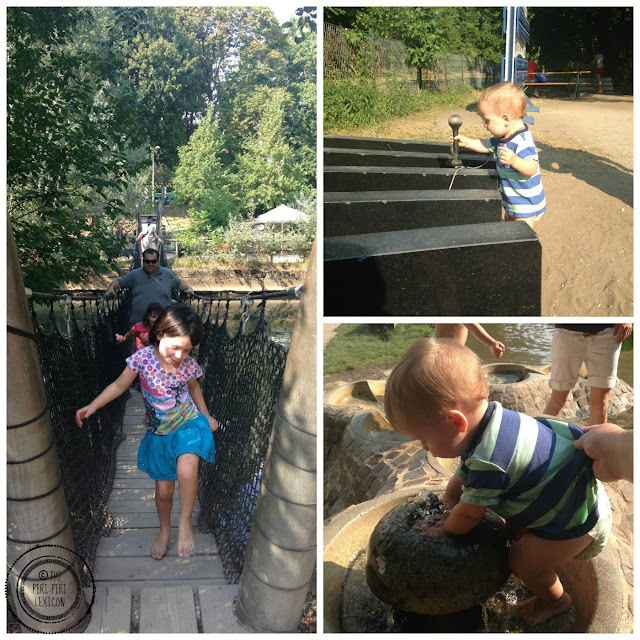 There are water play areas, like in all good German playgrounds, as well as little installations where kids can do all sorts of fun things. This year they could grind flour and make African-influenced flat bread to cook on an open fire, for example. We loved the smell section as well as the pots where you had to put your hands and discover what surprises lurked at the bottom. A really fun afternoon for all. A good shower afterwards was necessary as the water hole was not really inspiring in terms of cleanliness. Bonus for the adults: there is a beer garden just outside of the play area and you can come in and out all day for the same price. Apologies about the lack of very representative pictures but the kids spent most of their time in underwear!! We spent our third day near Ramsberg by the large Brombachsee lake. The weather was so hot that we needed a bit of swimming time. About 45 minutes from Nuremberg, with plenty of huge sandy beaches, the lake fit the bill perfectly. A great break from the city heat. We also saw a little bit of the recent German history with some of the remains of Nazi Germany. 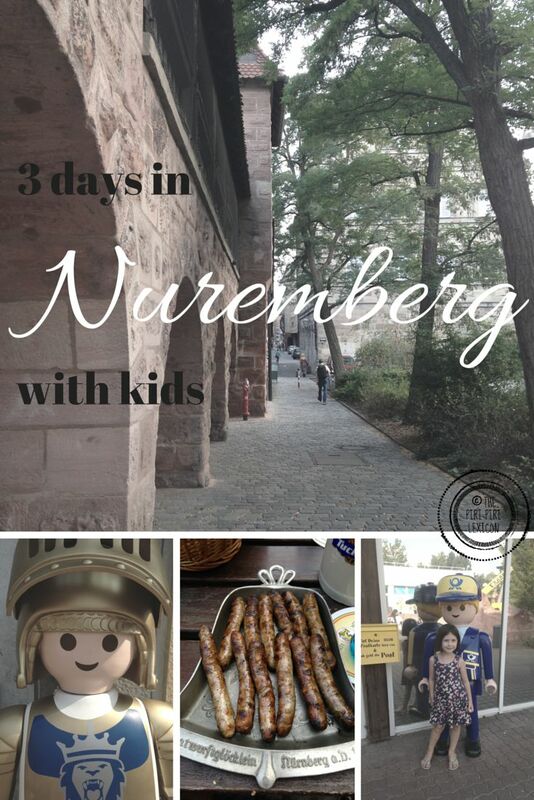 This was a tough history lesson to explain to the two oldest but with a little of background we were able to show them two places built by Hitler. The first one was what was supposed to become the Nazi party headquarters but was never finished. It is a amphitheater-like structure called Kongresshalle. 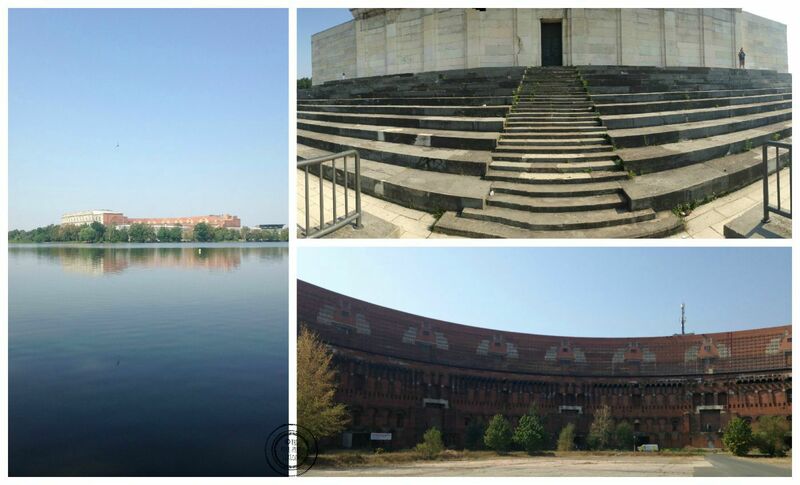 The second one is the Nazi rally grounds: the place used for parades. Both are free to look at. Both are close to each other in the south of the city and freely accessible with a few simple signs explaining their history. Big debates rage on in the city as to whether they should be maintained, cleaned and taken care of and to what level. And it shows. But I can understand the dilemma. Worth a quick visit even with kids. Hotel B&B near the station in Nuremberg. The hotel is ideal for families as you can sleep up to 4 people in one room (bunk beds and a double bed). The price is very reasonable and it is clean, modern and simple. Breakfast is extra but decently priced. If you are after a no-fuss central family hotel, we highly recommend it. The city centre is within walking distance and perfect for restaurants. Istanbul: a good Turkish food and honestly priced for the location. The girls loved the döner plates. Bratwurst Glöcklein: Traditional sausages and sauerkraut or potato salad served here since 1313. Simple, quick but a little pricey. Beautiful setting. No other kids options (no chips which is quite good actually). What a wonderful weekend - so much to see and do. 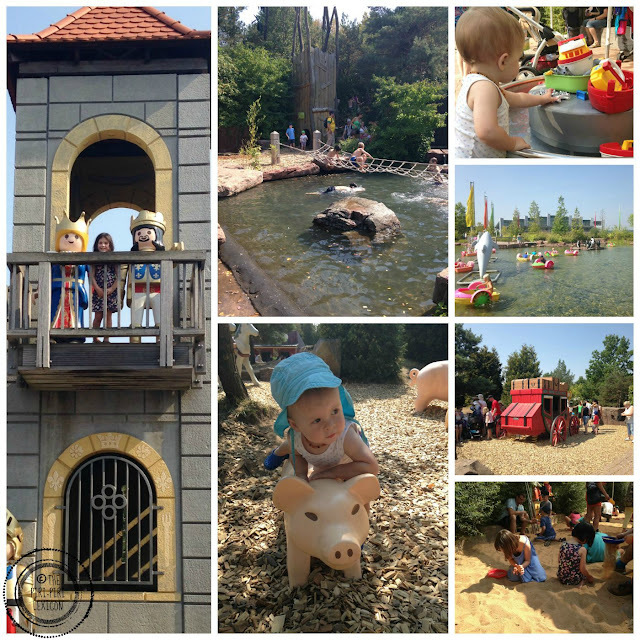 I loved playmobil as a child and really want to go to that park now! I know what you mean about having to explain stuff to the children, it is difficult to know what to explain and when. We have tried always to give age appropriate information, not to dwell on things unduly but to make sure that they are aware enough that the knowledge evolves and does not come as a big shock in due course. Thank you for linking up this month.